The Modern Transit Society web site has moved. To obtain this page in the latest version, change "trainweb.org/mts" to "moderntransit.org" in the URL (web address). Below is an archived version (September 2005). The transit system that served the East Bay was called the "Key System." In 1946, it had 88 electric train cars and 185 streetcars. The trains consisted of 1, 2 or 3 articulated cars (able to bend in the middle). This is just like Santa Clara County's light rail today. It used "3rd rail" for electric power (like BART) on the Bay Bridge and pantograph elsewhere. The trains were a modern design, built in 1937-39, and in many places shared track with some of the dozen streetcar lines to form quite a network. General Motors, and some other companies in the automobile industry, acquired 64% of the stock of the Key System (officially the Railway Equipment and Realty Company) through a "front" company, National City Lines, in 1946. They replaced the board of directors with their own stooges, who then approved a motion to scrap company plans to purchase PCC type streetcars and electric trolleybuses. Today it would be called a "hostile take-over." Orders for more trains were cancelled. Soon they started to decimate the system, first destroying the electric trolleybus line (that, while still under construction, was almost completed) followed by streetcars and electric trains. This 1941 map shows electric trains but not the dozen streetcar lines. Later in 1941, the A-line was extended to San Leandro and the F-line to Albany, using tracks of the Interurban Electric Railway. Traffic engineers favored destroying streetcars because they stopped one lane of car traffic while embarking passengers (goal #1). One might question why automobiles were allowed at all on streetcar tracks on the heavily used system. A study by the Oakland Tribune [6/11/48] stated that "96% of busses [sic] and 72% of streetcars entering and leaving downtown Oakland during shopping [midday] hours carried standees." In contrast, the city councils of Oakland, Berkeley and San Leandro (altogether then containing 78% of the population of Alameda Co.) opposed destroying the streetcars. GM unfolded its plans to destroy all streetcars in early 1948. An Oakland Tribune article [4/2/48] states that "Conversion of Oakland streetcar lines to motor busses [sic] was opposed by a 5 to 3 vote of the City Council last night. The action was recommended by ... Jay Czizek, city traffic engineer." In fact, the Oakland and Berkeley City Councils tried every legal maneuver they could to stop the destructions. But the PUC sided with GM [11/4/48] and allowed destroying the streetcars. 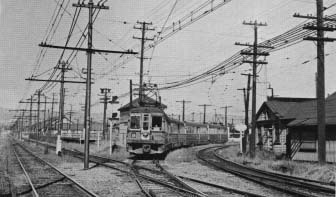 While streetcars were destroyed in 1948, the PUC prevented destroying all the electric trains. The A-trains went between San Francisco and San Leandro [photo, page 1]. The Oakland traffic engineering department wanted trains eliminated near Lake Merritt in an attempt to alleviate traffic congestion, by using the tracks of the trains for more automobile lanes. The traffic engineers' plan was realized by abandoning most of the "heavily traveled" A-line in 1950. Of course, the traffic engineers could have paid to widen the road for more lanes from their budget or paid to relocate the tracks. This would have been only just. Concurrently, large sections of Oakland were being demolished to make room for the Route 17 Freeway (now 880). But it would have decreased funds for catering to the automobile. GM tried to take further advantage of the situation be requesting the PUC that the entire A and B train lines be abandoned, but was denied. Trains cannot be faulted for traffic congestion. In fact, elimination of the trains increased cars, congestion, and pollution. 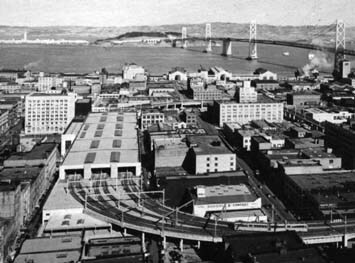 The Transbay Terminal and the San Francisco-Oakland Bay Bridge (and also visible the 1939 International Exposition on Treasure Island). Trains carried more people than all the automobiles on the bridge combined. The goal, of maximizing automobile throughput, instead of people throughput, resulted in scrapping the trains for more lanes of automobiles in 1958. The San Francisco-Oakland Bay Bridge was constructed for heavy-rail trains, with service commencing in 1939. Initially, three companies operated electric trains across the bridge: the Key System, the Interurban Electric Railway (IER), and the Sacramento Northern. In 1941, the Key System took over the IER routes, and the Sacramento Northern was discontinued. Rush hour trains came as frequently as every 2 minutes. Automobiles paid 25¢ toll and train passengers paid 2.5¢ toll, included in their fare. During the all-important rush hour, the Department of Public Works report shows that on the Bay Bridge, electric trains carried about twice as many people as automobiles carried. But this fact was simply irrelevant to the traffic engineers' goal of maximizing automobile throughput as opposed to maximizing people throughput. Replacement of the two train tracks with two automobile lanes would seem to be the correct response for the achievement of goal #2. Not quite. The number of peak direction lanes was not changed at all! The term used in the drive to eliminate the trains was to rebuild the Bay Bridge to "freeway standards". But one important scenario was ignored. The traffic engineers could have met both their goals of "freeway standards" (12-foot wide lanes to achieve goal #1) and 5 peak direction lanes, plus the general transportation goal of keeping the trains, by using reversible lanes, as is done for the Caldecott Tunnel. It would have resulted in 3 one-way top deck lanes, 3 one-way bottom deck lanes, 2 reversible top lanes and 2 train tracks on the bottom deck. The separation of the reversible lanes would have been with permanent barriers (not changing as on the Golden Gate Bridge). Instead, they chose to eliminate the trains. The fact that this would reduce bridge capacity to 1/3, in terms of people, was not their concern. Furthermore, while 2/3 of the bridge users took the trains, requiring merely 1/5 the bridge area, the Department of Public Works report stated that train capacity could easily be doubled just by using the existing tracks and terminal facilities. Considering this fact, bridge capacity was reduced to 1/6. Removal of the tracks resulted in the loss of 5/6 of the bridge's people carrying capacity. The report concluded that "Electric interurban railways have a greater capacity and offer safer and faster transportation (particularly during rush hours) than do other forms of transportation. Therefore, it is essential that the electric railways be retained on the present bridge." [Original document] Why were the conclusions of the traffic engineers so different from the Department of Public Works? They do have different goals. But keeping the trains would not have impacted even the traffic engineers goals in this case by very much, if at all. There may simply have been a desire to eliminate the competition. The new owner of the Key System, General Motors Corp., repeatedly tried to destroy the trains by requesting abandonment from the PUC. The combination of the political pressures of "freeway standards," the propaganda of the puppet Key System portraying it's own trains as undesirable money losers, and GM's successful efforts at greatly reducing passengers resulted in the state legislature authorizing destruction of the trains. The trains were eliminated on April 20, 1958. Tracks were soon changed to more automobile lanes. Much of the Key System's tracks were on exclusive rights of way. Traffic engineers supported removing the tracks and replacing them with automobile lanes -"converting" trains to buses. Because trains were "faster ... than other forms of transportation", this action guaranteed that taking transit would thereafter take longer than taking a car. (Shown: B-train to East Oakland). The fact that the destructions would eventually result in: 1) building costly freeways (in an attempt to handle the resultant increase in car traffic), 2) destruction of large sections of the city (to make room for freeways and parking lots), 3) personal injury, 4) noise pollution, and 5) air pollution was simply not part of the traffic engineers' mandate. In contrast, the city councils, having a much broader mandate, correctly opposed the destructions. They considered not only transportation in general, but all these factors as well. The fact that destroying streetcars and trains would soon increase congestion and vehicular travel time was in the traffic engineers' mandate (goal #1). But this was conveniently ignored by taking an extremely short term outlook. For example, a streetcar, carrying 70 people, would be replaced by 60 cars. Each "run" of the trains had to be replaced by hundreds of automobiles, at today's 1.2 average occupancy level. This also created a parking problem (which cities subsequently attempted to solve by passing requirements for free parking, the cost of which was also paid by transit patrons and bicyclists). Update: The struggle to allow trains on the San Francisco-Oakland Bay Bridge continues today. Click on for the Fight to Save the Streetcars and Electric Trains.